Cherax (Astaconephrops) pulcher sp. n.
A adult male from Aquarium Dietzenbach B immature male from Hoa Creek, West Papua C female from aquarium import (not listed in material examined) from Indonesia. A new species, Cherax (Astaconephrops) pulcher sp. 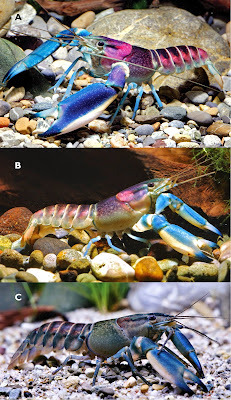 n., from Hoa Creek, close to the village Teminabuan in the southern-central part of the Kepala Burung (Vogelkop) Peninsula, West Papua, Indonesia, is described, figured and compared with the morphologically closest species, Cherax boesemani Lukhaup & Pekny, 2008. Systematic position: The presence of a decalcified area on the lower margin of the chelae of the first pereiopods in adult males shows that the new species belongs to the subgenus Astaconephrops. 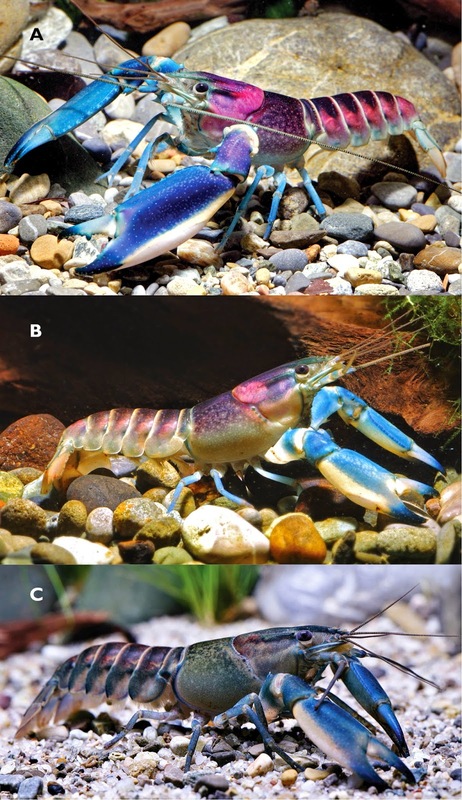 Seven species/subspecies are known from New Guinea: Cherax (Astaconephrops) lorentzi lorentzi Roux, 1911; C. (A.) lorentzi aruanus Roux, 1911; C. (A.) minor Holthuis, 1996; C. (A.) monticola Holthuis, 1950; C. (A.) misolicus Holthuis, 1949; C. (A.) albertisii (Nobili, 1899) and C. (A.) boesemani Lukhaup & Pekny, 2008. Etymology: The name is derived from the Latin “pulcher” meaning beautiful, alluding to the colourful appearance of the species. Ecology: Known only from the Hoa Creek and the general Hoa Creek Drainage area. The water is clear, and has pH 6.6. Currents are strong in the narrower parts of the creek, including the upper reaches. The substrate of the creek is rocky, and mostly covered with sand, stones and large rocks. To improve the knowledge of the distribution of the species more collecting trips are necessary.